SDHC up to 32 GB supported. Captured data can be stored in GBD (Graphtec Binary Data) or CSV file format. Capturing time* (when all 20 analog channels are being used with Logic/Pulse inputs turned off). *Figures are approximate. File size of captured data is 2GB in GBD or CSV file format on this chart. 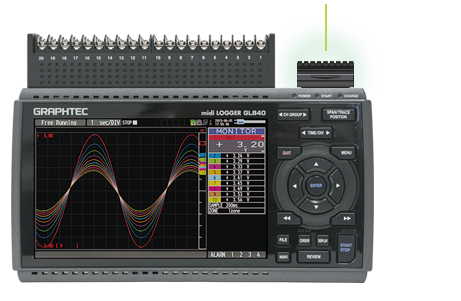 Sampling interval is limited by the number of channels in use (10ms:1ch, 50ms:5ch, 100ms:10ch). Limited sampling speed is available when digital sensors and GL100-WL are used as a remote monitoring device. Please utilize this file to sample the GL APS software. 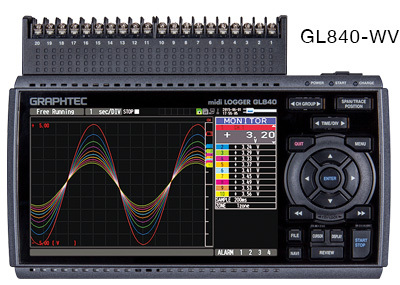 The GL840 is a comprehensive multichannel data logger and the best value market leader. This compact, various signal input datalogger accepts voltage, temperature, humidity, pulse, logic signals and more! 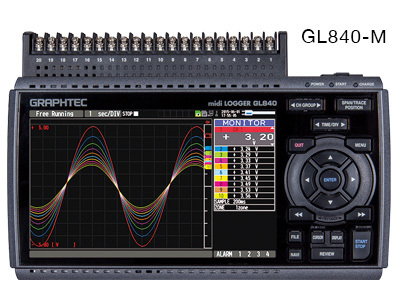 GL840 Comes with one year limited manufacturers warranty.